One of my goals this year is to be more intentional in how I spend my time and be more focused in how I plan and organize our day. For some reason this year is quickly becoming our most busy one yet (with three kids in school at different parts of the day). I loved sitting down and crafting a simple calendar for the month so that I could make sure I infused some simple play and fun activities into our day. This week we are focusing on the alphabet and doing simple alphabet activities! I made our monthly plan simple and not overwhelming and I listed off a few books that we want to read each week too. You can grab our FREE monthly calendar here. I love having a plan. I love that when I have 30 minutes of time with my toddler or preschooler we have something decided for us to do already. 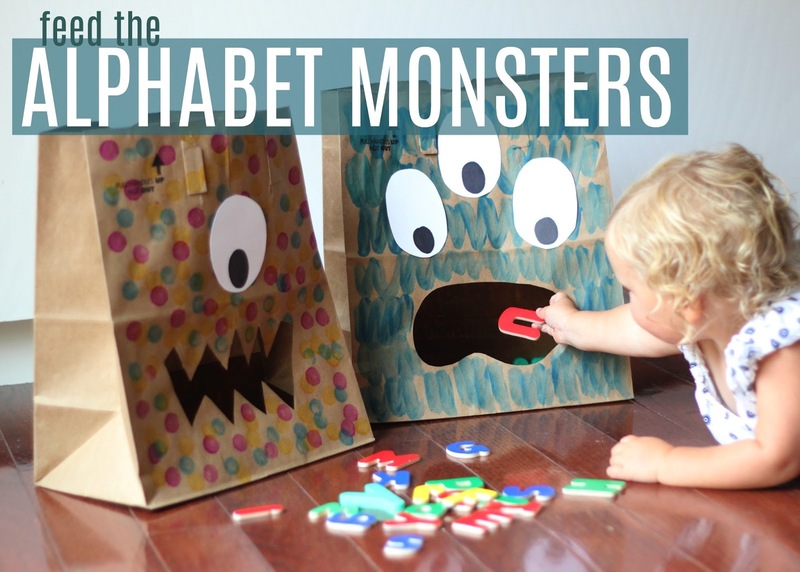 Today before naptime we played Feed the Alphabet Monsters! We did a version of this activity a few years ago and played Feed the LEGO monsters and today's activity was a hit just like that! 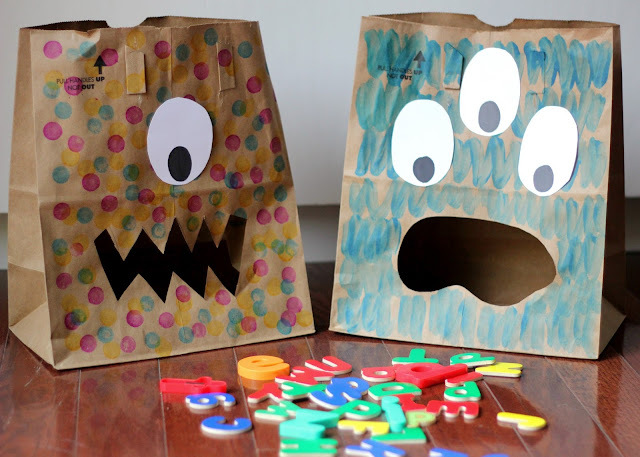 To make our monsters we just colored on the brown bags with dot markers. My daughter is hit or miss interested in painting with dot markers right now (usually she prefers to paint herself ;) and her mouth) so I just painted these bags and stuck eyes on them and cut mouths out! This is a great project to give to your preschoolers and early elementary schoolers who are learning scissors skills! Once the monsters were assembled, we made a pile of alphabet magnets nearby and my daughter figure out the activity pretty quickly without me needing to say much. She thought the monsters were SO FUNNY! We talked about the letters names and colors of the letters and she occasionally would repeat a letter name that she likes. She loved the letter "p."
Once the monsters were all full it was easy to dump out the letters and play again, or fold them up for playing another time. For older kids you can have them build words and let them feed the monsters their words! You can also talk about words that start with the letters while you feed the monster or call out a letter to find and then feed it to the monster. My daughter also had to feed herself some letters... just like the monsters did. She thought she was so funny. If you want other alphabet activity ideas, check out our post with 25 Easy Alphabet Activities. We also shared a Sticky Alphabet Tree earlier this week. Do you have any other simple favorite alphabet activities or books we should try?